My children are sometimes lazy to brush their teeth and I need to remind them to brush their teeth before they go to bed. 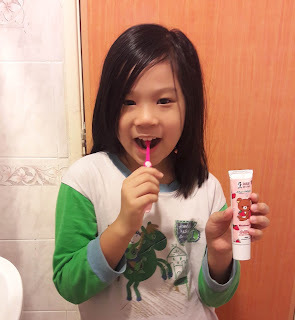 After trying out the new Darlie Jolly Junior toothpastes and toothbrushes, they love brushing teeth everyday. 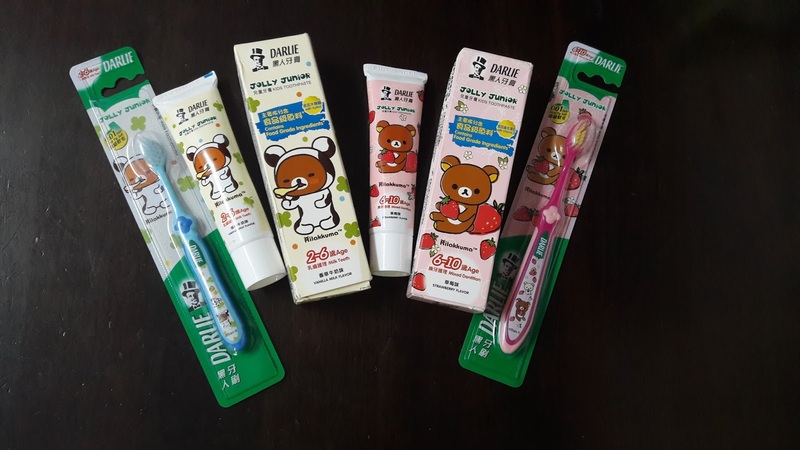 They really like the cute Rilakkuma packaging design and the sweet taste of the toothpastes. 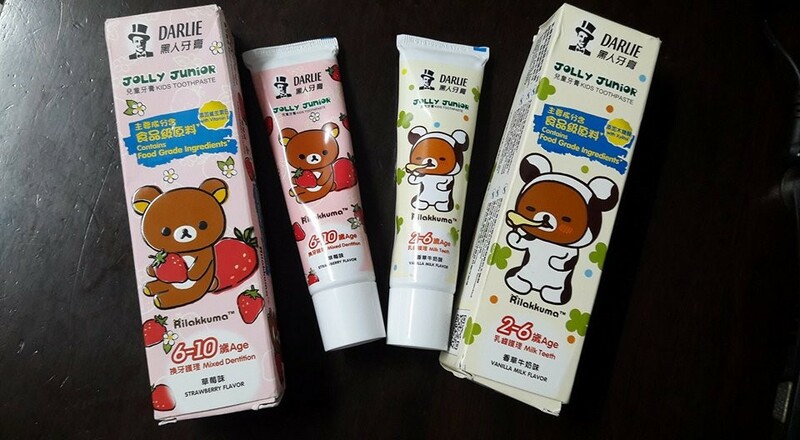 The new Darlie Jolly Junior toothpaste has 2 flavors - Vanilla Milk Flavor for children age 2-6 years old and Strawberry flavor for children 6-10 years old. These toothpastes uses food ingredients packed with Xylitol and Vitamin E for healthy oral hygiene. The Vanilla Milk Flavor toothpaste contains food grade ingredients with no added sugar and no animal originated ingredients. It is formulated with fluoride and calcium which helps in anti-cavity for healthy teeth. This toothpaste has Xylitol which is not easily fermented by cavity causing bacteria. 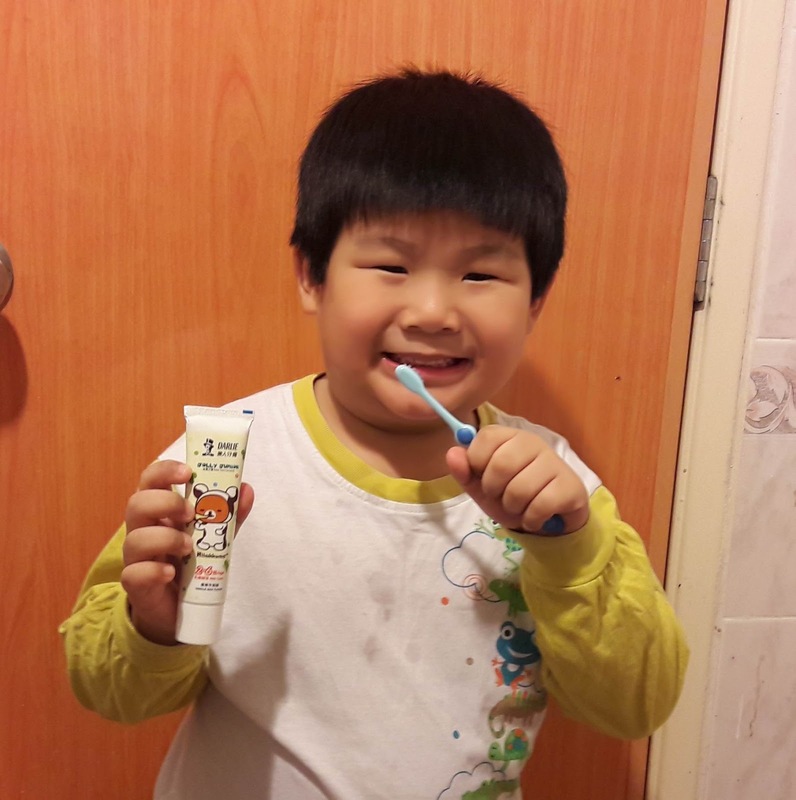 My son loves it because it is gentle and has the sweet Vanilla Milk taste. This toothpaste is in the form of gel to attract kids. The Strawberry flavor is for children age 6-10 years old with the same ingredients as the Vanilla Milk flavor. This is my daughter's favorite flavor and both my children told me they want to use Darlie Jolly Junior toothpaste because they love the sweet tastes. Now my children love to brush their teeth and surprisingly, I do not have to remind them. The Darlie Jolly Junior toothbrushes comes with 0.1 mm slim tip soft bristles that can gently clean kids' teeth. The compact head size is very suitable for young children. My kids love the anti-slip soft grip handle which is very comfortable to hold. 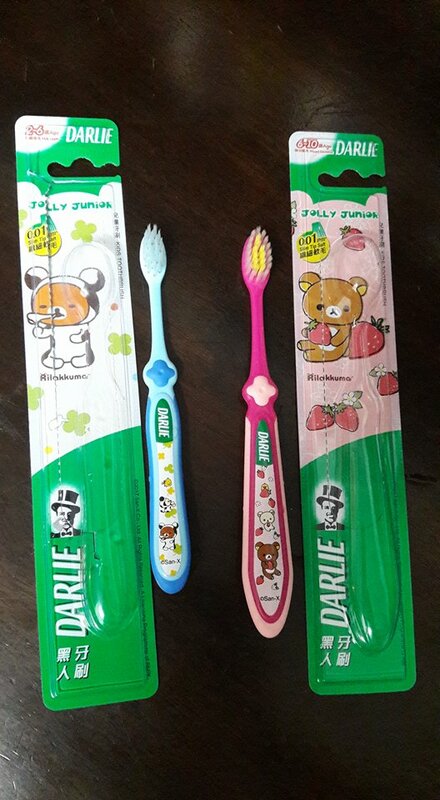 The best part is the cute Rilakkuma designs on the toothbrushes. It is very attractive to kids. If you want your children to have more fun brushing their teeth, you can download the Darlie Brush-Up App which is available on Google Play or App Store. 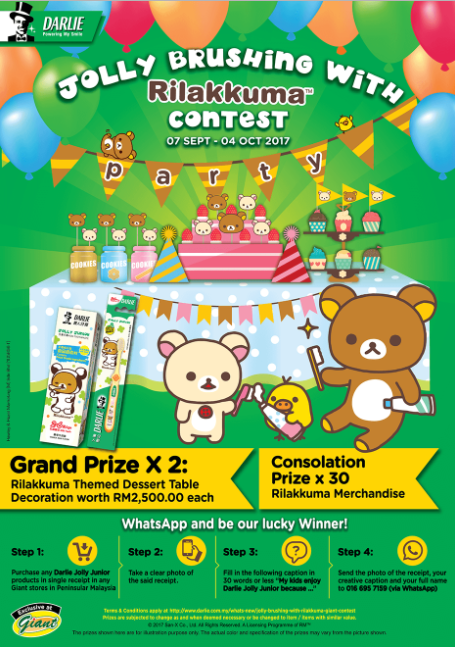 This app allows children to have fun brushing time with Rilakkuma as their buddy. This app also allows children to brush their teeth for 2 minutes with songs. To know more about the Darlie Brush-Up App, click HERE. If you have children age between 2 to10 years old, get your Darlie Jolly Junior toothbrush and toothpaste to join the current contest. 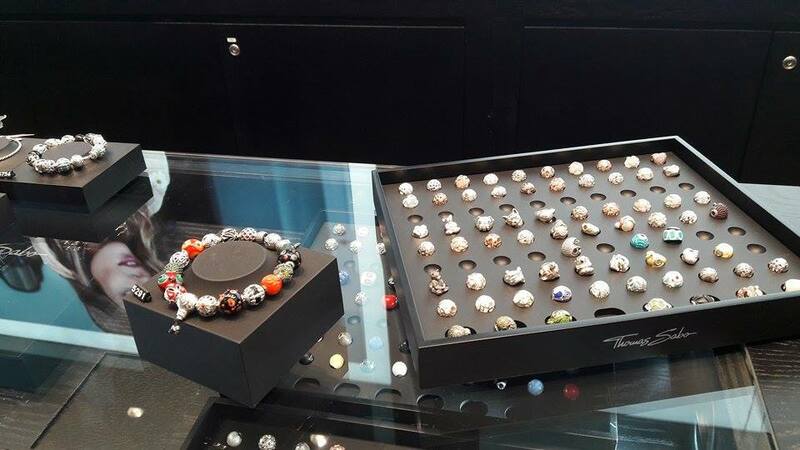 There are lots of great prizes to be won! 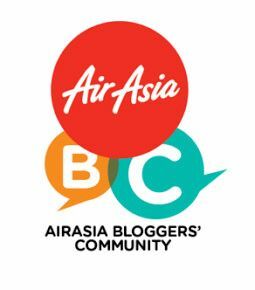 This contest is until 4 October 2017. For more information on the contest, click HERE. 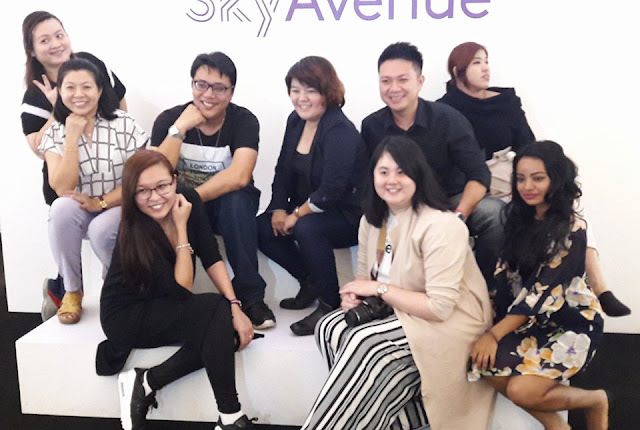 Last Saturday my children and I had the opportunity to watch the mesmerizing SkySymphony which is the latest attraction at Sky Avenue, Resorts World Genting. SkySymphony is also known as Kinetic Balls Show. 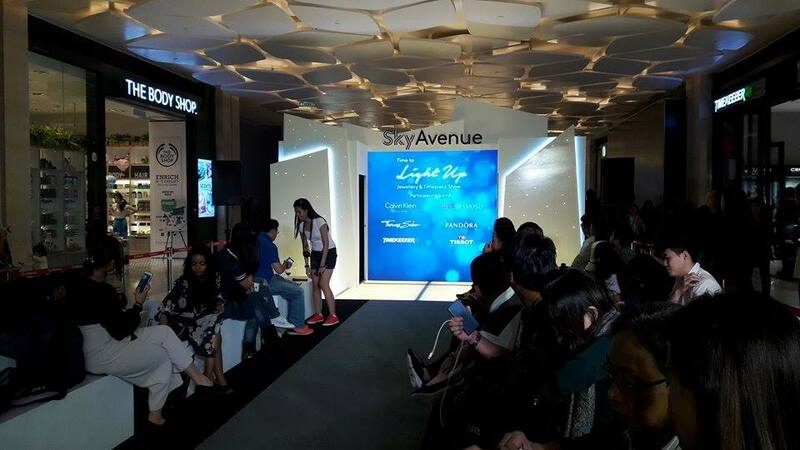 This is located at level 1, Sky Avenue and it's free to public. It is every 2 hours from 10am - 6pm and every hour from 6pm - midnight daily. 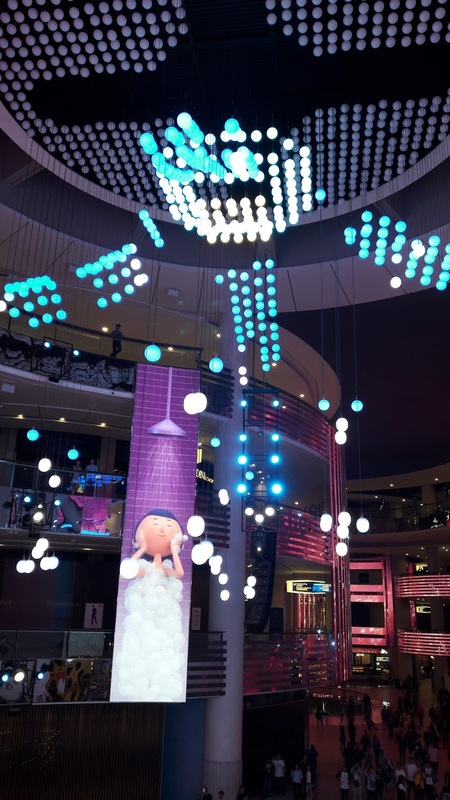 SkySymphony is the first multimedia winch attraction in Asia and the largest permanent winch installation in Asia. 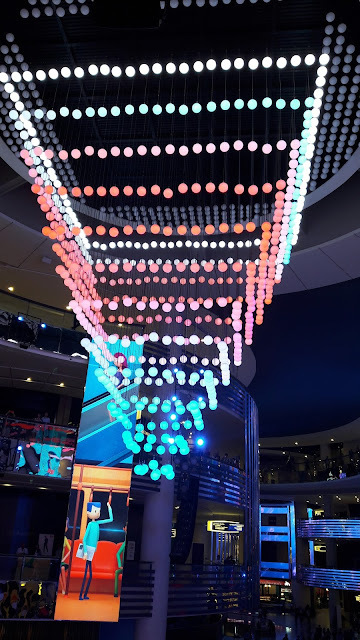 There are 1,001 winch balls suspended from a 4 storey high ceiling which moves up and down and with different shapes and colors. 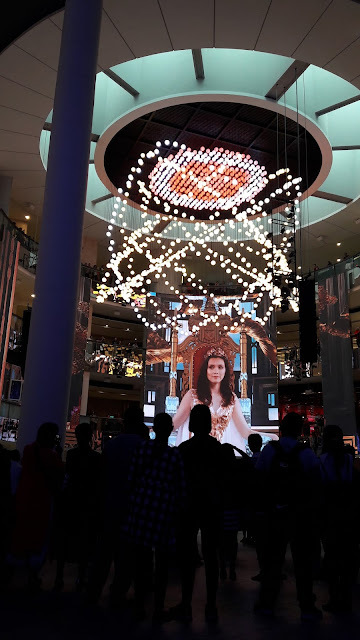 It is also accompanied by music and a large screen visuals. There are 3 different shows - Urban Symphony, The Goddess and Forest. I watched Urban Symphony and The Goddess. Come and see this beautiful mesmerizing SkySymphony show at Sky Avenue. You will surely enjoy watching it. Here are some videos of the SkySymphony show I recorded. 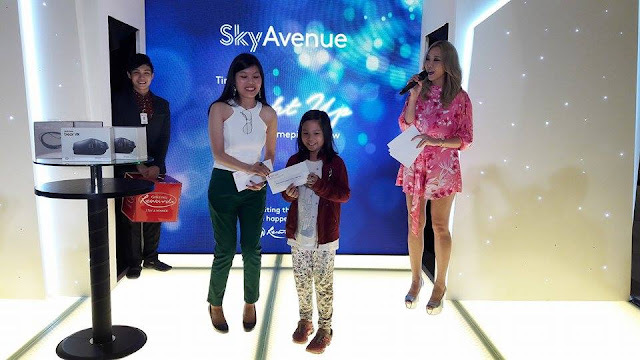 Sky Avenue at Resorts World Genting is a stylish lifestyle mall and has lots of exciting events happening here since its opening. 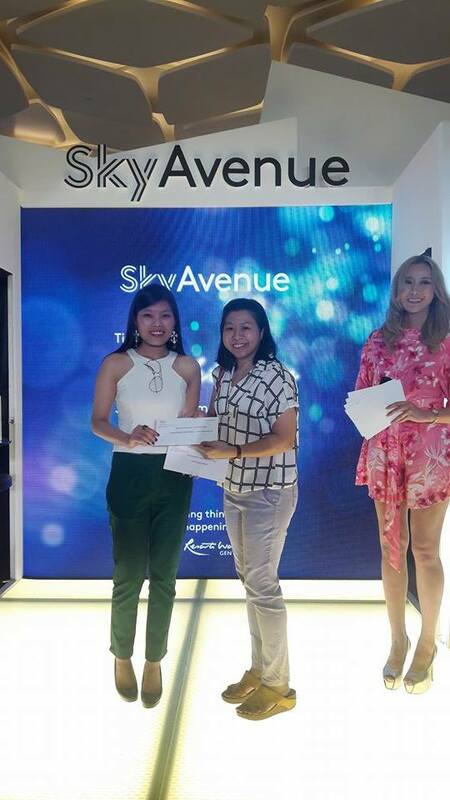 Sky Avenue is among Resorts World Genting's newest offerings that reflect its new phase of growth—other developments including the opening of the state-of-the-art Awana Skyway cable car system. 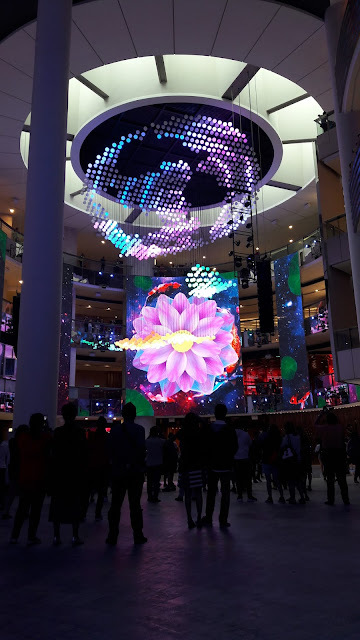 These new attractions are part of the Genting Integrated Tourism Plan to transform itself and solidify its position in the global hospitality and tourism market. 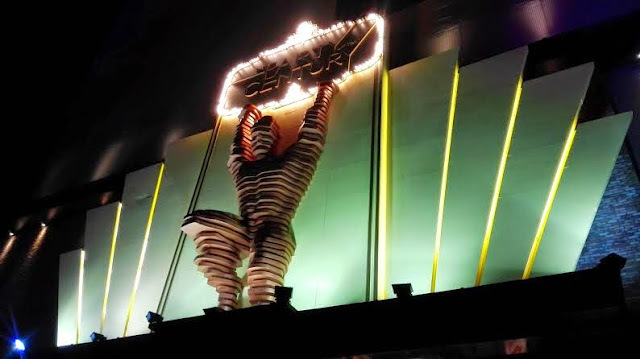 The developments bear testimony to the resort's ability to evolve and to create new and exciting attractions. 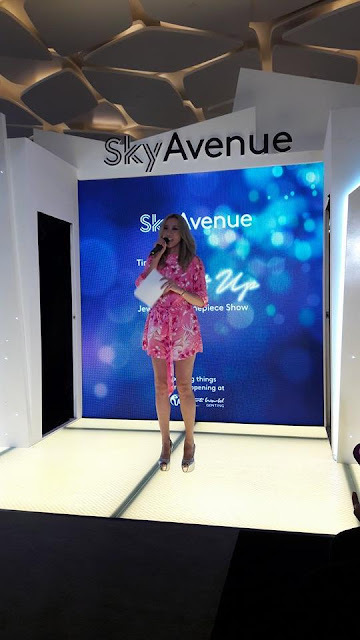 With SkyAvenue in place, the resort now delivers more options than ever before in terms of lifestyle shopping, entertainment and F&B. The retail tenants that have opened for business at the mall include such brands as Uniqlo, Sephora, H&M, Padini Concept Store, Giordano, Swarovski, Kiehl's, Timberland, Adidas Originals, Austin Reed, Lovisa, Esprit, DC Comics Super Heroes, Mood Board, L'Occitane, Bonia, Muse by Watson, Puma, and Samsung. 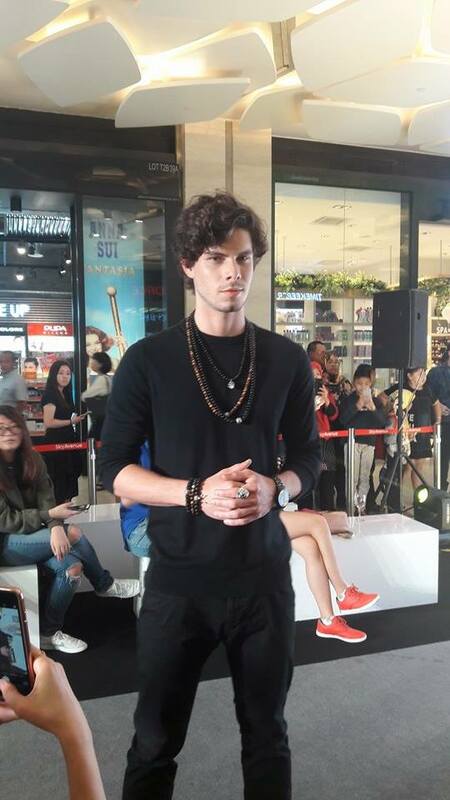 My children and I had the privilege to see the latest fashion show of jewellery and timepiece last Saturday. 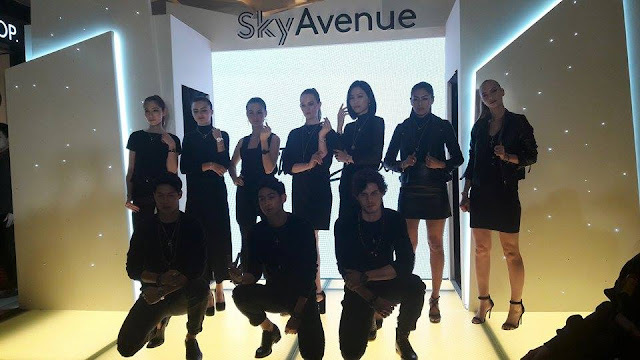 Featuring the latest collections of all the jewellery and timepiece tenants at SkyAvenue, today's fashion show at Level 3 of the mall, is the perfect platform for beautiful people to mingle and be seen. 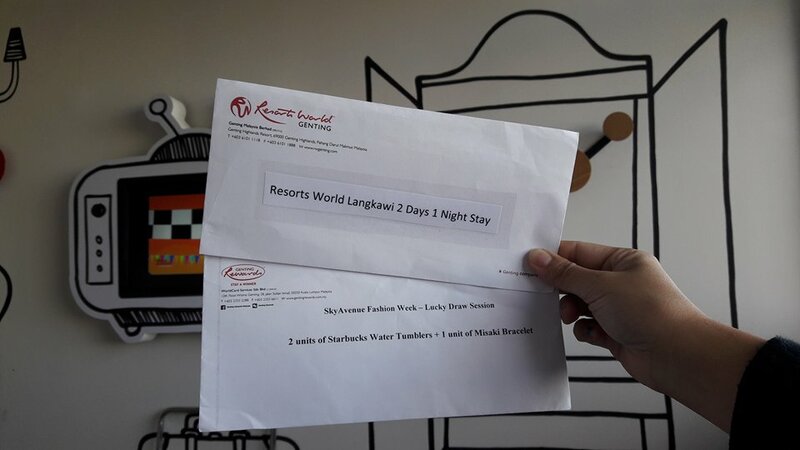 There are lots of lucky draw prizes for guests to be won including hotel stay at Resorts World Langkawi and Hotel on the Park, Starbucks tumbler and food vouchers from Coffee Terrace and Motorino. Motorino is among SkyAvenue's latest list of tenants which is also a famous international F&B brand. My daughter and I were very lucky to win the lucky draw prizes. 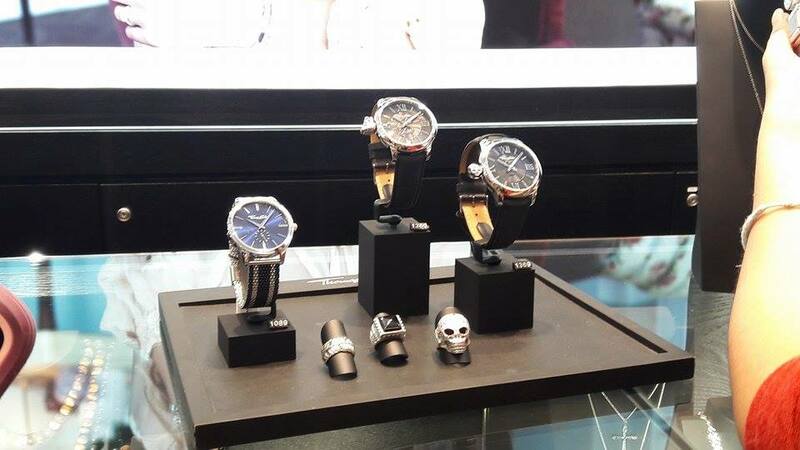 Among the latest collections are G2000's Autumn collection and Esprit's Winter collection. 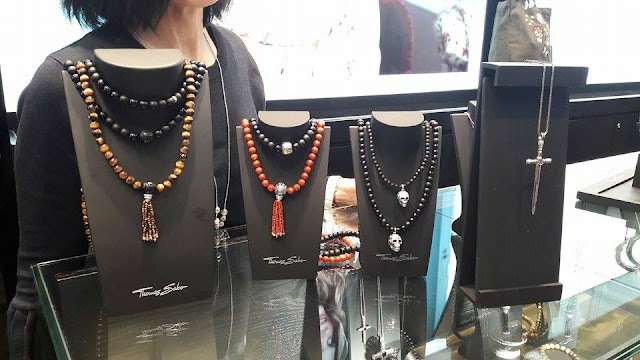 The main highlights is Thomas Sabo's new jewellery statement for Autumn/Winter 2017 that connects two central themes: yearning for the faraway and love of the familiar. Avant garde looks, filigree diamond jewellery, elegant sterling silver essentials, and items of jewellery that can be personalised with engravings. 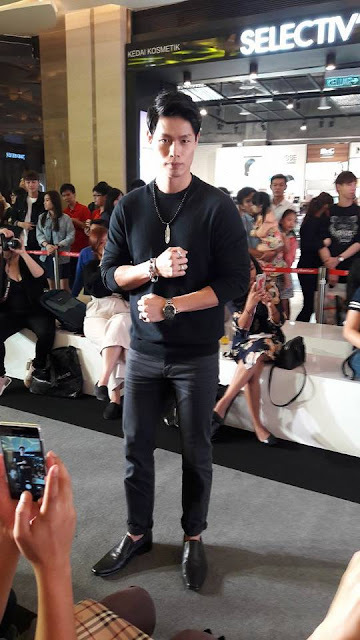 The pretty and handsome professional models walked down the runway showing the latest jewellery and timepiece collections. The world of Pandora continues to woo us—this time with its breathtaking designs like the Cascading Glamour Chandelier earrings that highlight sterling silver and zirconic stones. Inspired by Pandora Heart, a new Hearts of Pandora series has been introduced, featuring new band rings in sterling silver, Pandora rose and 14K gold. There's also Pandora's Moment Open Bangle, a versatile carrier in a contemporary form in a choice of interchangeable caps—minimalist polished or glittering pave. A photo of RWG influencers posing like models. 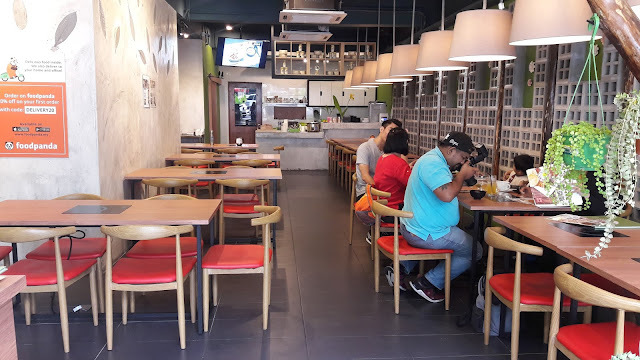 There is great news for vegetarians and those who love to eat vegetarian cuisines because Sandalo Healthy Vegetarian Cuisine is where you can indulge in delicious and healthy food without worrying too much about acidity from meat which could cause cancer. Sandalo Healthy Vegetarian Cuisine is located at Damansara Utama, Petaling Jaya. It was very difficult to find parking but you can park at Starling Mall if you cannot find parking here. I was lucky to find a parking lot nearby this restaurant. Take note that the meter parking machines cannot be used, you need to buy the coupons to pay for parking here. 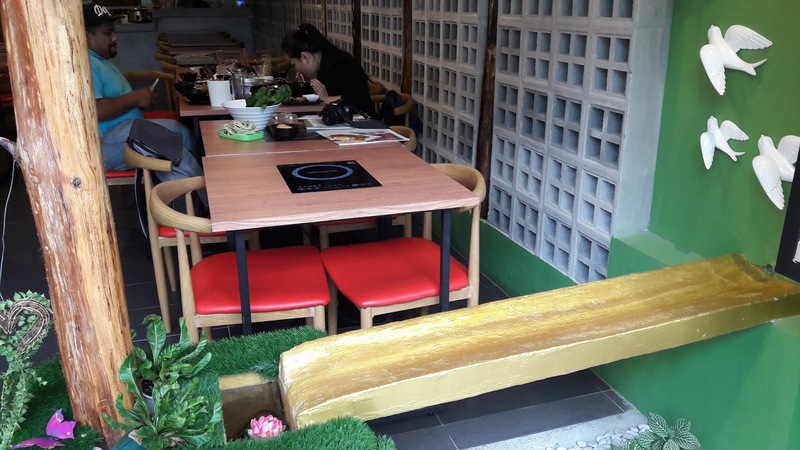 The restaurant environment was very cozy, comfortable and clean. Johnson, the owner of the restaurant introduced the menu and ordered the recommended food for us to taste. I love to eat vegetarian food because there is no garlic and onion which I dislike. 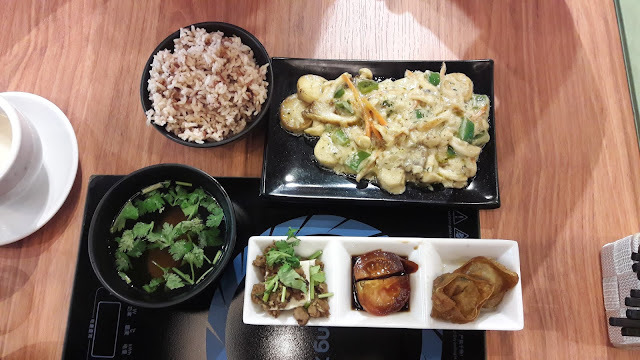 White Sauce Trio Mushroom Rice (RM 18.90) came with healthy brown rice, delicious creamy white sauce with three different types of mushroom. There was also crispy wanton, tomato and soup. 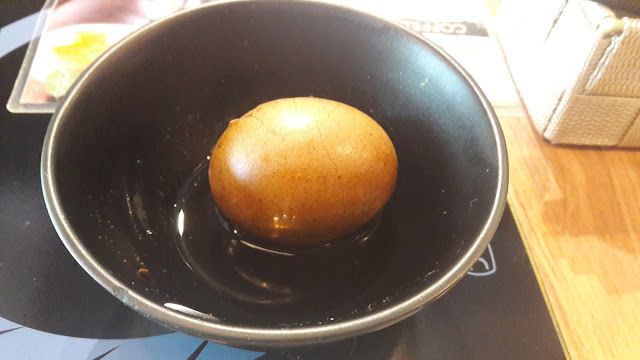 This Herbal Egg (RM2.80) had a lot of herbal taste and was very delicious. 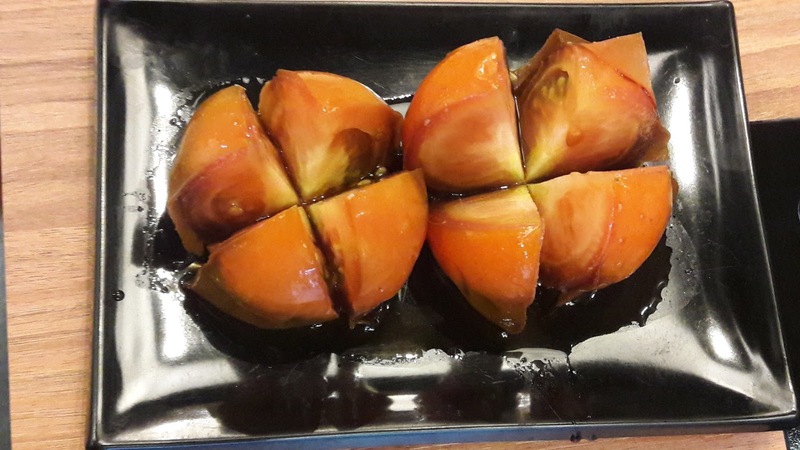 Froze Tomatoes (RM 6.90) was quite sweet and not sour at all. I love the cold taste. 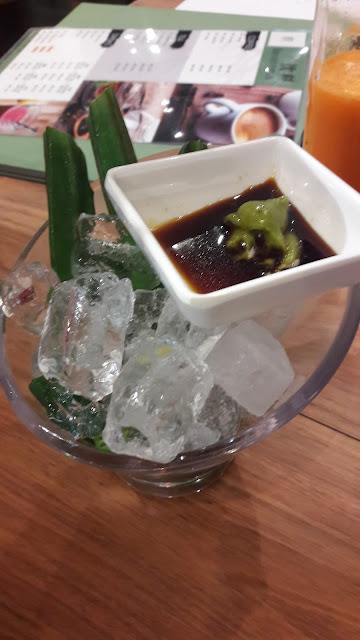 Froze Lady Fingers (RM 7.90). 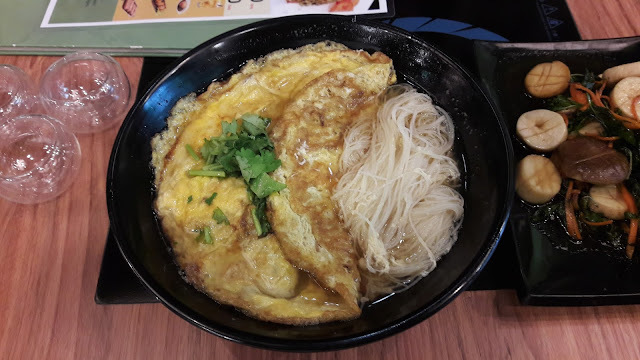 This dish looks simple but surprisingly tasted really good. Recommended to eat with soy sauce and wasabi. Wine Noodle (RM 18.90) had too much of the wine taste which I did not really like. Probably those who love wine would love this dish. Milky Crispy Abalone Mushroom was my favorite. Both the dipping sauce were very tasty. 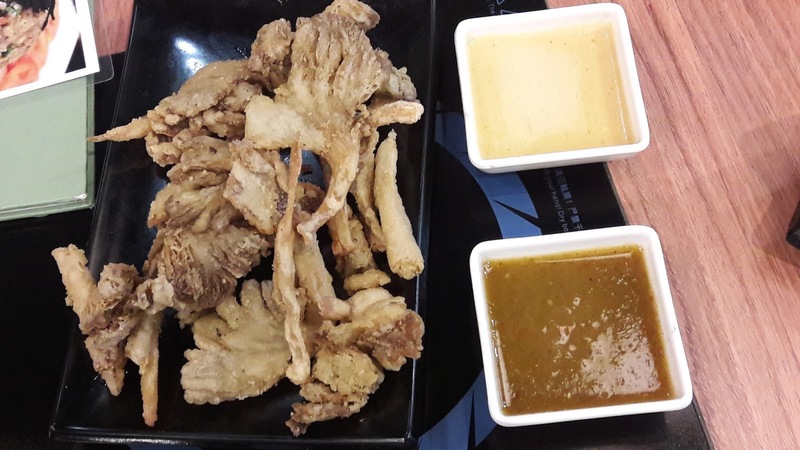 The lighter colored sauce tasted like butter sauce and the other was a little spicy and sour. 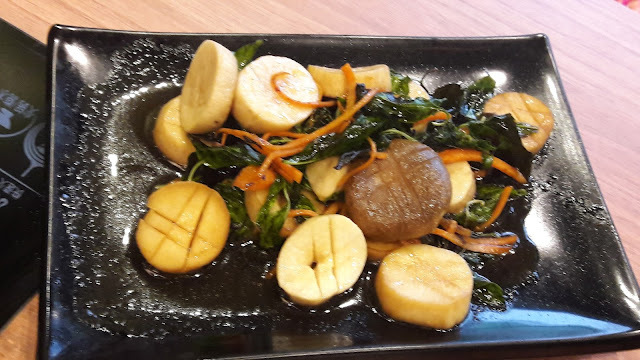 Fresh Basil Leaf, Huadiao Wine, Ginger and King Oyster Mushroom tasted really nice because the mushrooms were very fresh and the basil leaf made the sauce tastier when eaten together. This was a great combination. 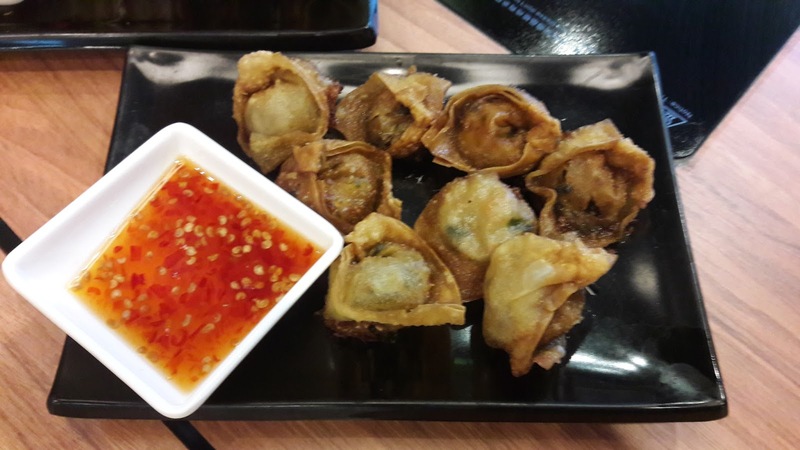 Sandalo Fried Wantons (RM 8.90) were very crispy and tasty. 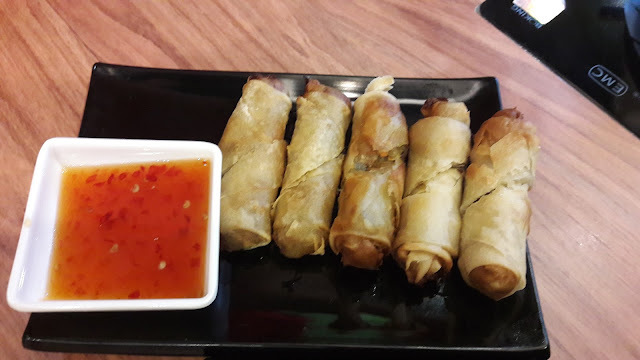 Sandalo Spring Rolls (RM 10.50) tasted very delicious and fried to perfection. We also had steamboat here. 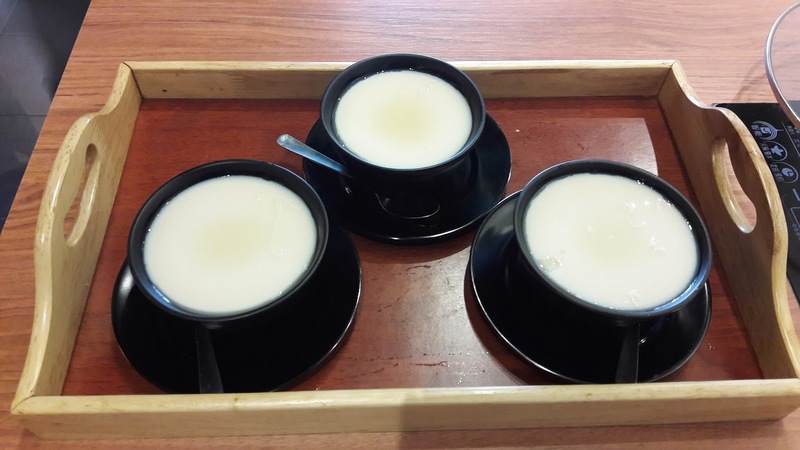 The cheese soup was very tasty, not too salty or too thick and it was very delicious. 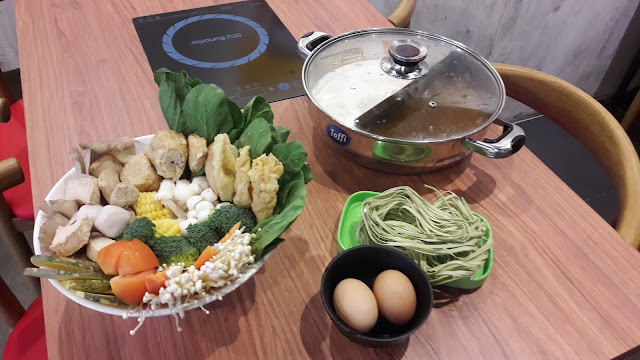 Do try it if you are here to have steamboat. The seaweed soup was spicy and tasted unique. The Tofu Fa is a must try too because this was the best I have tried so far. It was very smooth and really good. I really enjoyed eating the food here. 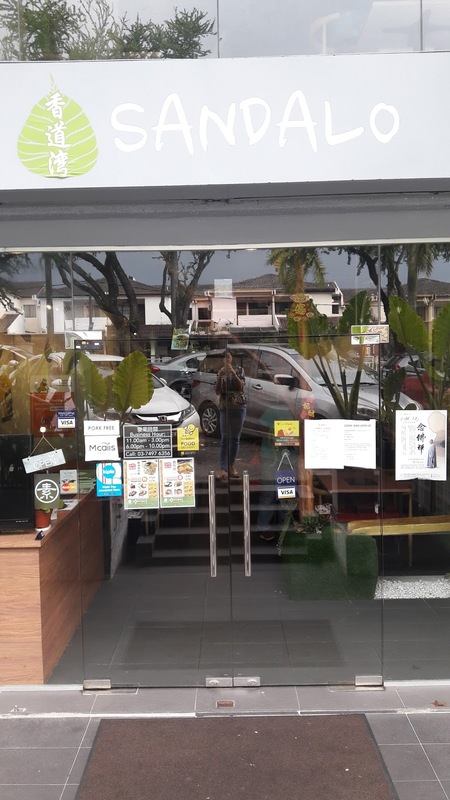 If you want to eat healthy vegetarian food, come to Sandalo Healthy Vegetarian Cuisine to dine. 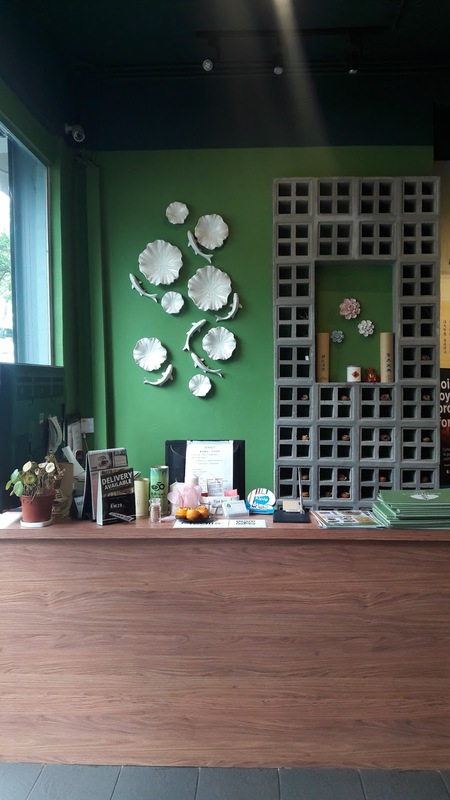 Thanks to Kiple for arranging this food review. Download the Kiple app on your mobile to save money when you pay. For more information on Sandalo, visit their FACEBOOK or WEBSITE. Klang Parade opened in 1995 and is a great shopping center and entertainment hub. 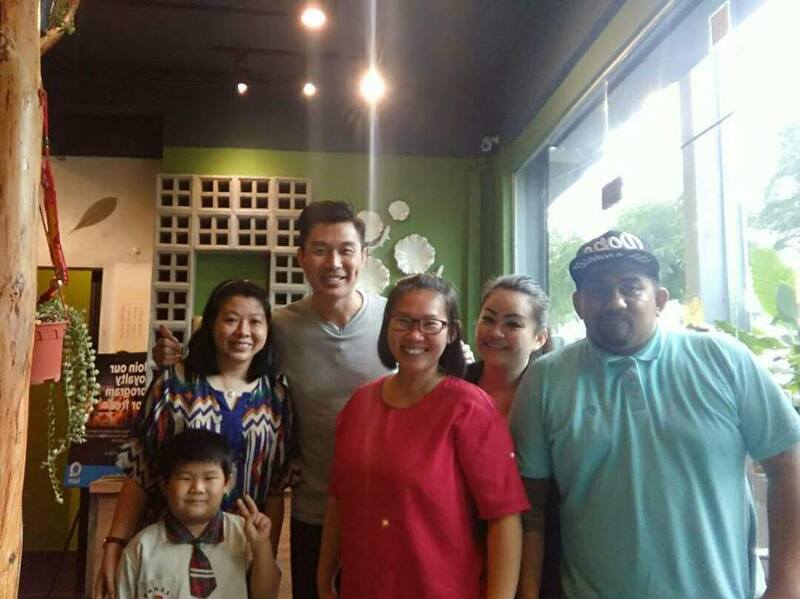 Shopping at Klang Parade is a pleasant experience for my family. There are lots of things you can do here. 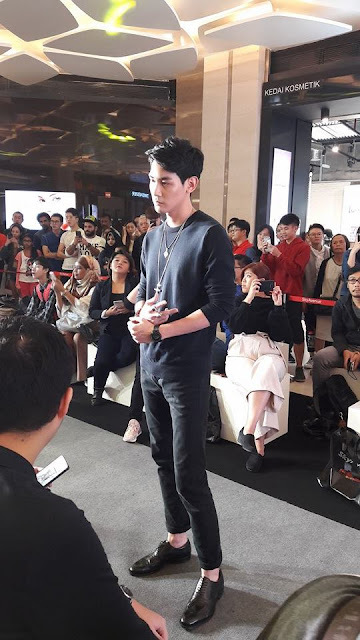 Besides shopping at these stores such as Parkson, Econsave, Kamdar, Bata, Mr. 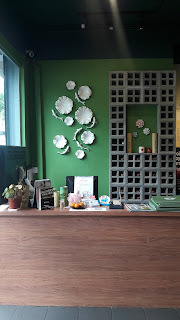 D.I.Y., City Chain, Focus Point, you can also watch a movie at Golden Screen Cinemas. If you have children, you can bring them to Kid'z Paradise for a day of fun playtime. 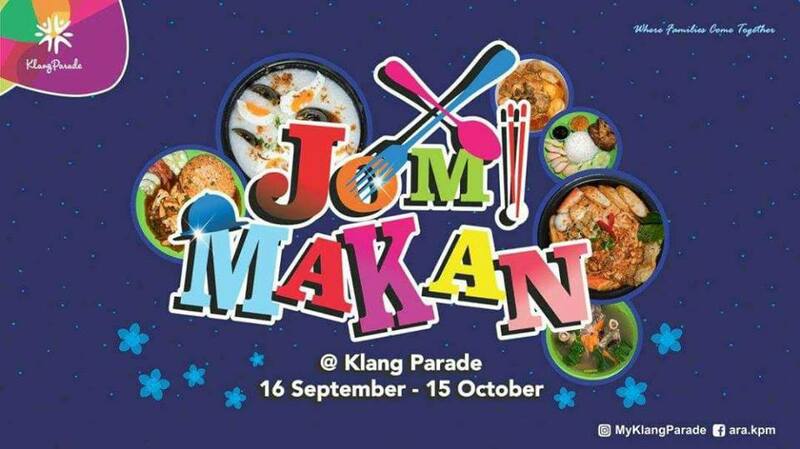 Now is a great time to come to Klang Parade especially during the Mid-Autumn Festival. 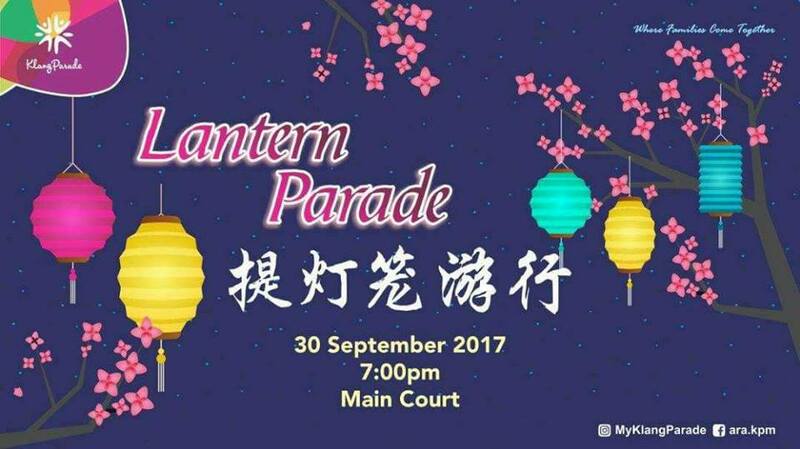 There are lots of beautiful Mid-Autumn Festival decorations and a Lantern Parade on 30 September 2017. 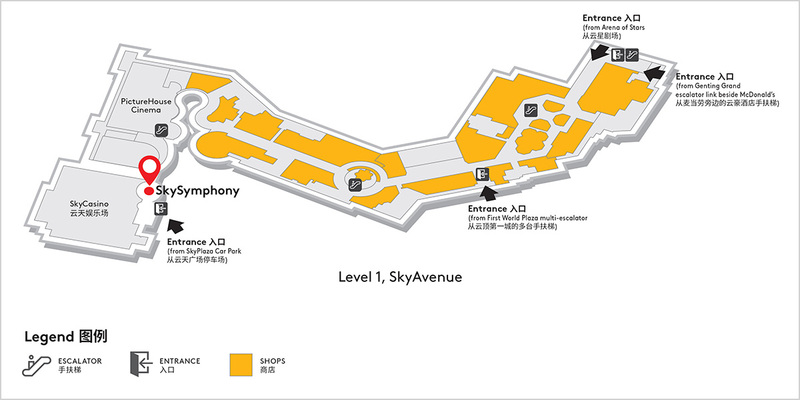 When you are shopping here and feel hungry, you can find lots of Food & Beverages outlets here. There is Old Town White Coffee, Shihlin Taiwan Street Snacks, Texas Chicken, Tako Wan, Baskin Robbins, Nice Smell, Big Apple Donuts & Coffee, Candy House, Koong Woh Tong, BlackBall, Secret Recipe, Boat Noodle and many other restaurants. Klang Parade is having a 'Jom Makan' promotion from 16 September - 15 October 2017 where you can redeem a gift and enter the lucky draw. Continue to read my blog post to find out how. My family and I love to eat desserts and we would love to visit Big Apple Donuts & Coffee on 5th floor for some delicious donuts. My son and I love to eat sweet delicious donuts and there are so many different types of donuts to choose from. 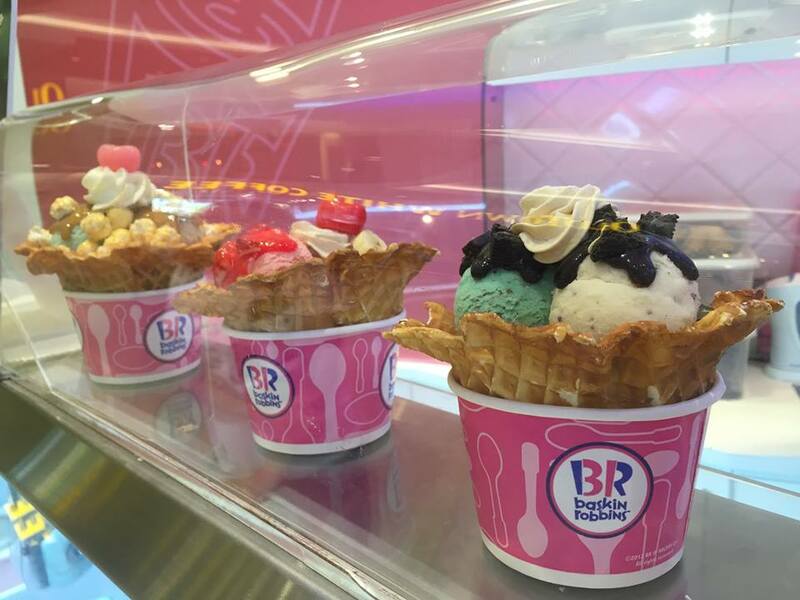 During hot days, we would treat ourselves to Baskin Robbins ice-cream. 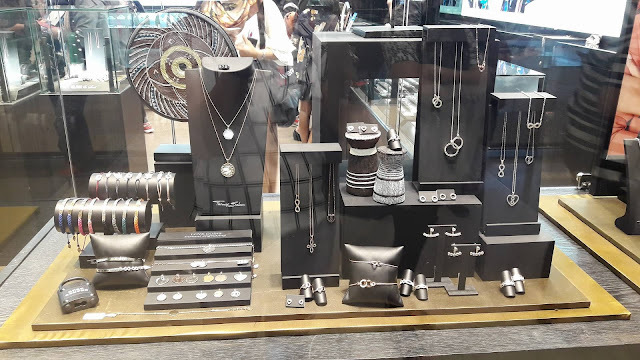 This is located on ground floor of Klang Parade. If you are looking for some nicely decorated birthday cakes, you can check out the beautiful Baskin Robbins' ice-cream cakes. If you have sweet tooth, don't forget to drop by at Candy House on ground floor of Klang Parade. 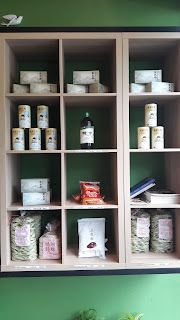 You can find various types of candies and snacks here. Children and even adults love the snacks here. 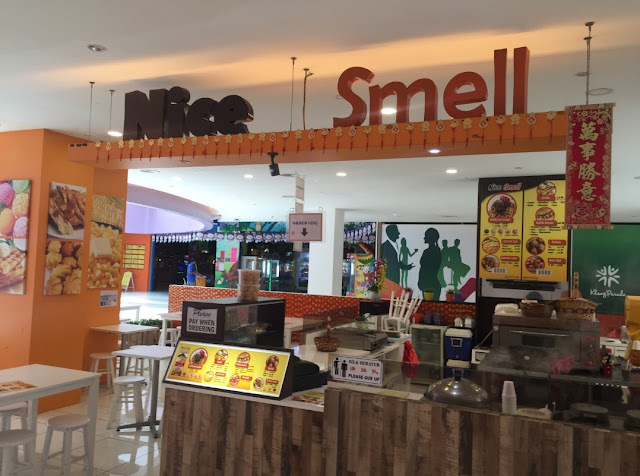 Nice Smell sells very crunchy and delicious waffles. My daughter loves to buy corn in a cup from Nice Smell and my son loves their waffle with ice-cream. Klang Parade is having a promotion where you can redeem 1 unit of Micro Thermo with a minimum of RM 30 (maximum 2 receipts) from any F&B outlets of Klang Parade. 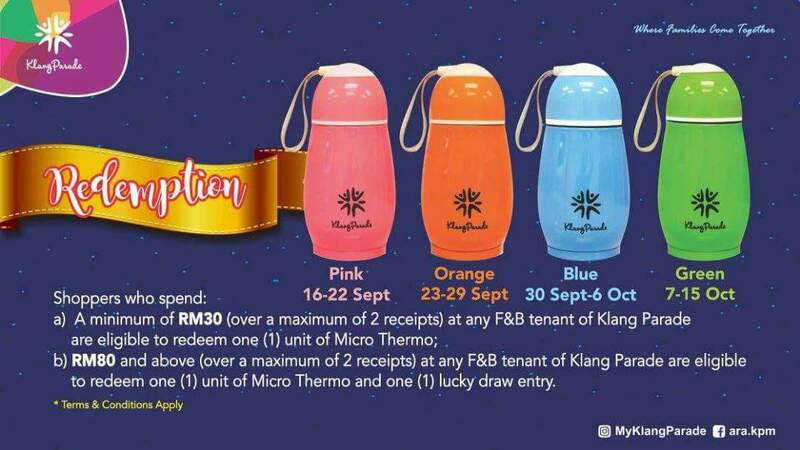 If you spend RM 80 and above (maximum 2 receipts) at any F&B outlets, you can redeem 1 unit of Micro Thermo and get 1 entry to their lucky draw. The Grand Prize of their lucky draw is 1 unit of OGAWA TENS Therapy Electromagnetic Foot Massager worth RM 1,999. 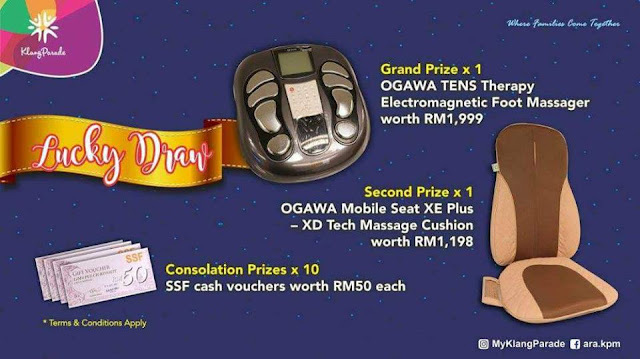 The second prize is 1 unit of OGAWA Mobile Seat XE Plus - XD Tech Massage Cushion worth RM 1,198 and 10 Consolation prize SSF cash vouchers worth RM 50 each. Let your friends know about the 'Jom Makan' promotion and drop by to try your luck on the lucky draw. 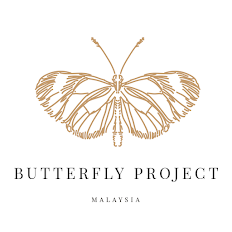 For more information about Klang Parade, visit their website HERE.